Mind control — specifically, the ability to manipulate machines or the environment through the power of our thoughts — has long been the fascination of sci-fi enthusiasts. Now, a team of European researchers has made a giant leap toward turning this sci-fi fantasy into reality: They have demonstrated human mind control of gene expression in a mouse. And, they used some of the best tools of neuroscience, physics and synthetic biology to accomplish it. When the subject was meditating, the field generator was sent an ON signal, and it created an alternating magnetic field. This allowed the authors to utilize wireless energy transfer which, as its name implies, powers a device without the use of wires. The alternating magnetic field created by the transmitter coil induced an electric current in a receiver coil, which ultimately powers the device. (This phenomenon, known as induction, is also used to power electric toothbrushes and alerts stoplights to the presence of a car.) In this case, the device is a special implant placed on the back of a mouse under its skin. When the implant was powered, it turned on a near-infrared light. The photons activated a protein (DGCL) taken from the photosynthetic bacterium Rhodobacter. 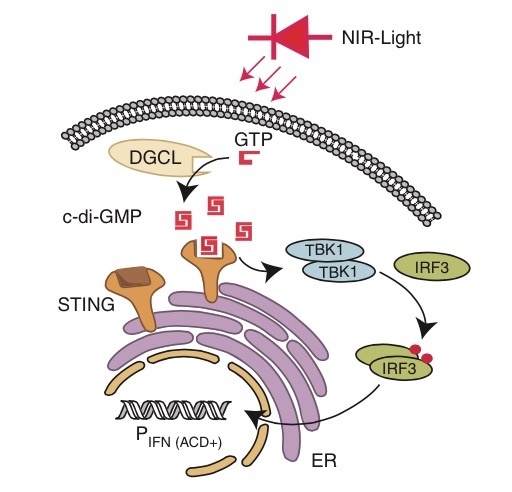 When exposed to near-infrared light, the protein creates a metabolite called c-di-GMP, which is sensed by a protein receptor called STING. Ultimately, STING results in the activation of yet another genetically engineered gene that encodes an enzyme called SEAP. This enzyme was secreted into the blood of the mouse, and its presence could be detected with a simple chemiluminescence assay. 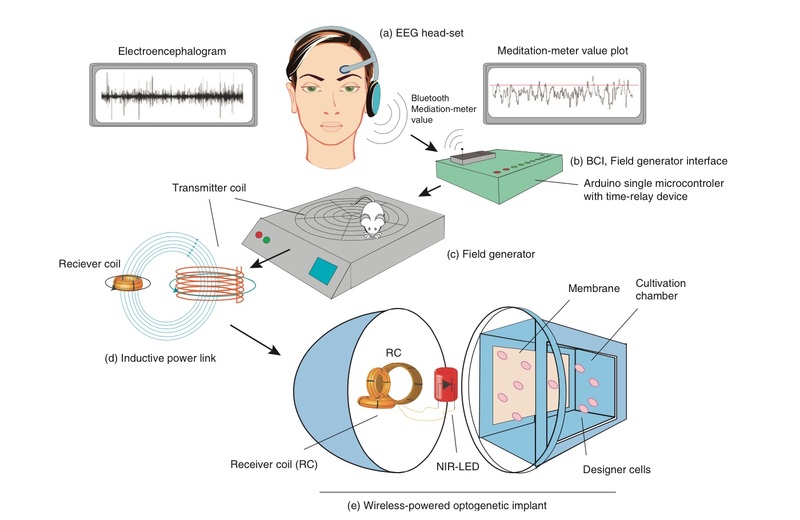 In summary: Brain waves –> Bluetooth (microwave photons) –> Electric current –> Magnetic field –> Another electric current (in the implant) –> Near-infrared photons –> Activation of cellular genetic pathway –> Enzyme produced and secreted into the blood. Immediate applications for this technology are probably still years (decades) away. But, the idea of altering gene expression by the power of thought alone is both intriguing and frightening.